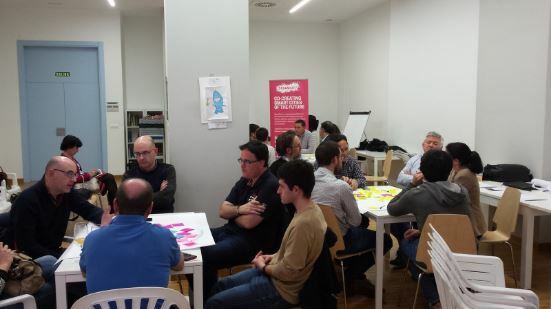 On Monday April 10th, OrganiCity hosted a workshop in Santander to analyse the process of designing, submitting and implementing an experiment using OrganiCity infrastructure. This workshop was part of a common initiative carried out in the 3 cities of the project, Santander, London and Aarhus, devoted to give the best orientation to the 2nd Open Call for experimenters that will take place in 2017. 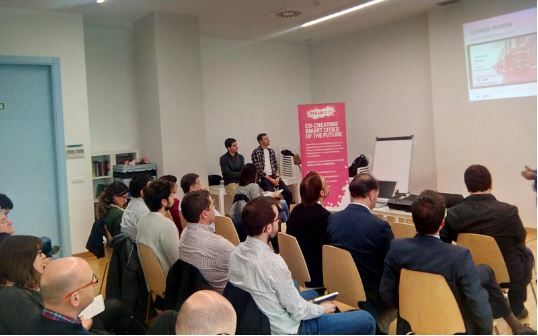 The main objective of this workshop was to detect what are the main difficulties encountered by potential experimenters at all the stages of the process of an experiment in order to be able to give the best definition and support during the 2nd Open Call. For this purpose, the consortium took advantage of the experience acquired by experimenters in the 1st Open Call, both from those that were awarded and from those that submitted a proposal but unfortunately were not selected for financement. After making the corresponding dissemination through the social media channels (Facebook and Twitter) and by means of direct email, 20 people attended the event. The selected venue was the Numancia Civic Center, located in the city downtown. The event was divided in two stages. In the first stage a brief introduction to OrganiCity project was provided. This was made taking into account that there were some newbies recently engaged into the project. After that, it was turn for the description of the main aim of the workshop and its overall structure. The second stage of the event was the one in which the workshop was properly carried out. The attendants were divided in groups forming heterogeneous but well focused teams. Each group was formed with at least one experimenter already awarded in the 1st Open Call, an attendant that submitted a proposal in the 1st Open Call but was not awarded, an attendant that was aware of the Open Call but decided to not submit a proposal and a newbie. Each group was supported and guided by a member of OrganiCity consortium team. The objective of this mixing of profiles was to balance and enrich the interactions and to try to obtain a maximum outcome for each participant (including OrganiCity partners). 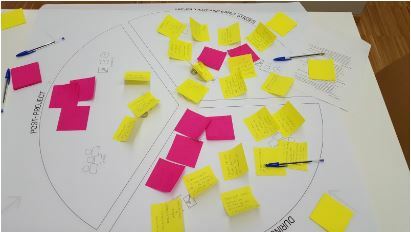 Using an experimentation ecosystem map similar to London’s one and with an OrganiCity member as a guidance, the experimenter user journey was performed. For each phase of the experiment (pre-project, during project and post-project) a set of previously prepared questions were asked in order to talk about challenges, issues, etc. on each phase. During the activity office materials (sticky-notes, sheets, etc.) were used to foster creativity and for documentation purposes. Also, several copies of public documents used during the 1st Open Call were available to solve practical doubts and maintain concretion during the discussions. The event and the structure were very successful not only from the point of view of OrganiCity members but also from the attendants one and the prove was that it surpassed thoroughly the allocated time. Attendance participation and production were very fruitful, specially thank to the generous contribution of experimenters already awarded that were able not only to give confidence on their possibilities of being successful in the next Open Call to other participants but also to give important clues and insights for preparing the experiment since the very first conception of the idea. In fact, only those that have passed to the whole experiment process were the only one able to give such kind of perceptions and understanding. The adequation of the scope of the proposal is paramount. The short period of time (only some months) for carrying out the experiment and the reporting requirements advise to design the experiment as a proof of concept of something greater or adapt a broader project or a part of it to the proposal. As sustainability is supported by a greater scope but also to be realistic is important a well-balanced between both aspects has to be achieved in the proposal. A right balance among group experimenters profiles is considered crucial. It’s ideal to have a multidisciplinary team at the time of proposal preparation: technical, ideologist, business and sustainability expert. For co-creation purposes arranging meetings in the first phase of the experiments should be complemented by a way to collect input and feedback during the whole life of the experiment. There is a potential great impact that can be obtained by a local entrepreneur/SME thanks to the OrganiCity consortium dissemination activity that foster experimentation even without financing. Another significant insight is the corresponding the need of contingency plans. As the experimentation period is very short, when designing an experiment it is important to develop a comprehensive contingency plan to avoid the big impact of administrative and/or technical issues can have in the experiment. We are eager for having the next opportunity to maintain such interesting interactions with experimenters in the clinics to be held during the summer after opening the 2nd Open Call. Building OrganiCity is a continuous challenge but every step in which we connect with citizens and experimenters is highly rewarding. In the meantime, we are keen of receiving your ideas or requests at info@organicity.eu. Also, you can sign up to our newsletter to learn about future events.